At the end of the last article I had completed the addition of the window to enter a check. 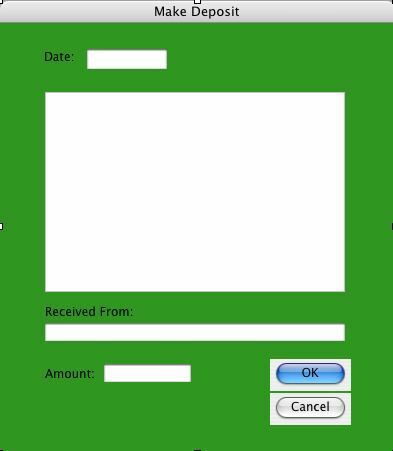 This article will demonstrate how to add: making a deposit, withdrawing from an ATM, saving the check register records, and various application menus. To add the capability to record deposits, we need a new window. I do this, as you will recall, by going to the Project Window and clicking on the Add Window button to create a new window titled “Make Deposit.” To this I add a listBox, three editFields, two buttons and a few labels. This depositWindow is shown in Figure 1. Beginning at the top, the Date editField is made a member of the dateEntryClass so it will act in the same manner as the Date editField in the check writing window (see Part 2 article). Next, the listBox, depositorsList, will display a list of the people from whom I commonly receive money. Clicking on a name in the listBox will place it in the Received From editField; a new name can be manually entered in that field also. And, as was the case in the checkWindow, when a name is selected in the listBox, the cursor advances to the Amount editField, named depamount so you can easily enter the amount of the deposit. msgBox "The Depositor Names file is missing." This method is virtually identical to the method I used to populate the checkWindow listBox in Part 2 of this series. msgBox "You must enter a Deposit Source"
msgBox "You must enter a Deposit Amount"
It closes the Deposit window. This completes the programming needed so you can record deposits in your check register. When you make a withdrawal from your checking account using an ATM, the only things you need to record are the date and the amount of the withdrawal. So I'll build a simple window with only two editFields for those two parameters. You can see it in Figure 2. Just as I have done in the checkWindow and the depositWindow, I've made the dateField a member of the dateEntryClass. This pre-loads today's date and will check the date format for accuracy when the user clicks the OK button. msgBox "You must enter an Amount"
As you can see, this verifies that the user has entered a valid and correctly formatted date, and has entered an amount for the withdrawal. Then, just with the OK button in depositWindow, I"ve built a record of the withdrawal, sent it to transList, incremented the transaction counter, recalculated the balance, set the change flag and closed the window. As with depositWindow, the Cancel button merely closes the window. This last button in transWindow has not yet been coded. Before I do that, I must add some new methods in this window to manage file handling. If you recall the procedure I used in Part 1 to read the data file and insert each record into transList, it involved two separate methods. The first, readDataFile, opened the file, read the records one at a time and sent each one to addTransRow. The method addTransRow took each record, parsed it, and inserted the various fields into transList. I used this approach so that I could use the addTransRow method every time I wanted to populate transList. You have seen it used for record handling in both the window you use for recording deposits and the window you use for recording ATM withdrawals. I will use a similar procedure to write the records to disk. First, I'll write a new method, sendTransRow, to extract the fields of a record from transList and prepare them for writing to disk. Another new method, writeDateFile, will count through all the transactions and poll sendTransRow for each transaction, take the result and write that result to disk. If you look at the method readDataFile in Part 1, this is essentially the same, except that here I'm writing records to a disk rather than reading them from as disk. // reads that row from transList and formats it. // It returns a string record for writing to disk. // a tab - chr(9) - as the delimiter. This tests the flag that has been set to be true every time a change is made to the check register, whether by writing a check, making a deposit, or withdrawing money from an ATM. If the flag is true then the check register is written to the data file. In the future, any other files that have been opened will be tested here in saveAll. For those of you who have downloaded and tested the application to date, you've noticed that there is already a Quit menu selection just where it is supposed to be in the application's menu. That's because REALbasic includes that menu item and its functionality with every project. (It also populates the Edit menu, but doesn't include any edit functions.) However, even though all of the necessary commands are included in the four transWindow buttons, I'd like to duplicate those capabilities with menu selections. I do this by going back to the Project window and double-clicking on the MenuBar. This reveals the Menu window, which is shown in Figure 3. As you can see, I've added the menu "Transactions" and populated it with three menu items and a separator. Each of the menu items has a name and I'll use that name to program the functions of each menu. In a similar manner I add the Menu Handler for the Make Deposit menu. I click on the Add Menu Handler button, select TransactionsMakeDeposit from the popup menu, and enter the same code that was used for the Deposit button. I follow the same routine to prepare the functions of the ATM menu item. To add the Save and the Save & Quit menu items, I return to the Menu window (Figure 3), click on the File menu to highlight it and click Add Menu Item. In just the same way I added menu items to the Transactions menu, I add the two remaining menu items. 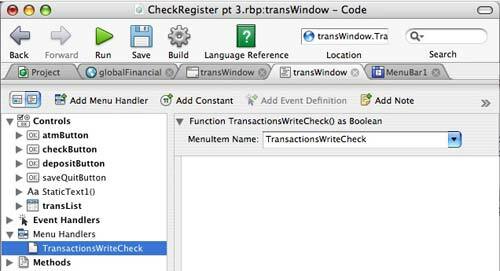 Then, returning to transWindow, I add the coding for these items in the same manner as the Transactions menu items. What happens if I try to Quit the Check Register without saving changes? You are already familiar with the common Mac feature that stops the quit process and issues a query about saving changes. To accomplish this, I first add a method to transWindow named promptSave and define it as a boolean function. d.Message="Do you want to save changes to this document before closing?" d.Explanation="If you don't save, your changes will be lost. " Select Case b //determine which button was pressed. This method introduces two new things: the MessageDialog Class and the Select Case statement. You're already familiar with the MessageDialog seen in Figure 5. The comments in the code abov, explain how the MessageDialog is presented and how it operates. The Select Case statement looks at b, which identifies which button has been pressed, and defines what action to take for each case -- that is, each button.